The most popular messaging application application WhatsApp is updating there services with more and more features and security things each day. Regarding the Group privacy and security company has done so many modification recently too, which includes giving admins more privilege to manage the group. Now, an admin can restrict a group in which he can control, how the messages are sent, he can restrict the privileges of the group members. Unlike the old feature of adding a new member and assigning a member as admin, now admin can dismiss another admin and convert him as a normal member too. This option is directly available in the Group Settings option, where as one admin can dismiss another admin without removing him from the group. Even though this feature is available, there is another big feature missing in the application, which is, we cannot remove our-self as an admin from a group. Let see the matter in detail. 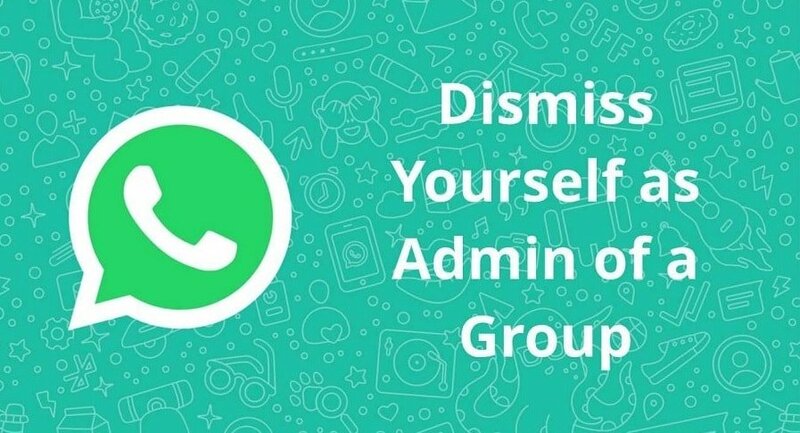 If we are added to a group and being assigned as the Admin of that group, we cannot delete the role of admin our-self, the only option available is to exit our-self from the group and to ask the other admin to add again to the same group as member. Or you can ask another admin to dismiss you as admin from the group. In both case, you need the help of another admin to do so. But now, we have a trick by which we can remove our-self as admin and be the part of the same group as normal member even without the help of any other admin. As we mentioned earlier, in some situation, we need to change our role from admin to normal users, because in some case we are assigned as the admin without our approval too. Any admin of the group can assign you as the admin, It doesn’t need your approval. Also, if an existing admin left the group, the admin role is automatically assigned to a random member. This also, we cannot stop. In all these cases we need to change our admin role. Now let see the actual trick here. Step 1: If you are a group admin, then within the group chat window, click the 3 dots (settings) on the right top corner. Step 2: In the available option, you can see an option called Group Info, click on that. Step 3: Now, the next screen will show you the group details such as the participants, settings option etc. Step 5: Now, in the new screen you may see an invite link generated with options such as Send via WhatsApp, Copy Link etc. Step 6: Click on the ‘Copy Link’ option, now the link is copied. Step 7: Now please keep the copied link in some where else, in a notepad or any where you can. Step 8: Now come back to the Group Info page, scroll to the bottom, you can see an option called ‘Exit Group’. click on that. Step 9: A confirmation window will come up and ask you to exit or not. Click on ‘Exit’. Step 10: Now you are removed from the group. The last step is to take the previously copied invite link and click on that, Now it will ask you to join the group or not. Click on ‘Join Group’. Done, now you are the part of the same group as a normal member. In this way you can remove your role as the admin from a group without any others help and be the part of it as normal member.